If you have a local Walmart near you and are GF, it's worth a trip to see if it carries Heartland GF oven ready pasta sheets. I stocked up after making this because who knows if it will continue to be carried and the price can't be beat! I loved how easy it was to put together and having a no boil lasagna, GF no less, makes it even easier. I found assembling this the day before and then baking had great results. The pasta was able to absorb some of the moisture and liquid of the sauce, making it really flavorful and overall, a tighter lasagna that didn't spill out when cut. I'm thankful to have found Heartland GF pasta and it's definitely made me happier to know I can have a GF lasagna that tastes just as great as the traditional gluten laden variety! In a medium sauce pan over medium heat, heat the olive oil. Add the onions and garlic, cooking until softened. Add the tomatoes, basil and oregano. Reduce heat to low, simmering for 1 hour. Season with salt and pepper to taste. Cool and store in the refrigerator until ready for use. In a 9x13 pan or lasagna pan, cover bottom and sides of pan with 1 cup of tomato sauce. 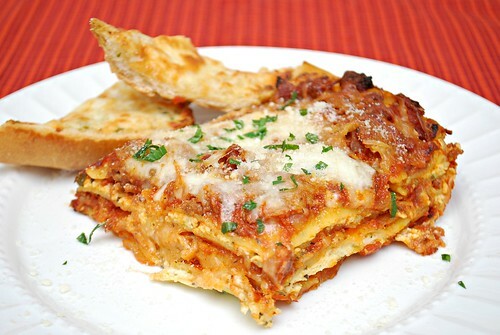 Lay 3-4 sheets of lasagna noodles over tomato sauce, overlapping by 1/2 inch. Add another layer of remaining sausage and pepperoni. Cover with remaining tomato sauce. Top with mozzarella and Parmesan cheese. Transfer assembled lasagna on a baking sheet. At this point, lasagna can be covered and frozen. Bake in preheated oven for 45 minutes until cheese bubbles around the edges and the top is melted and golden brown. If baking from frozen, add 15-20 minutes cook time or until it's bubbly. Cover loosely with foil if it's browning too quickly. Remove from oven and let it rest for 15 minutes before serving. This look super yummy! Italian sausage is always a winner! Ohhh! We're having non-gluten free lasagna for dinner tonight, but I like the idea of this for Passover!